Scourge is a mercenary who primarily kills super-villains and is a top foe of Captain America. The long list of Marvel Universe characters who have met their end at the hands of Scourge is extensive. This is the most recent version of Scourge played by Dennis Dunphy, known as the wrestler and vigilante Demolition Man (or D-Man for short), has had a dubious and difficult career as a costumed adventurer. Although he began as one of Captain America’s closest allies during a difficult time for the patriotic hero, much of his life following that has proven hard. Related Dork Side Toys links: Marvel Legends Scourge, All Marvel Legends, Newly Listed Marvel Legends Captain America Civil War Wave Set of 7. Predacon fans have no worries, as a long awaited update of a Classic character finally makes his appearance at BOTCON! 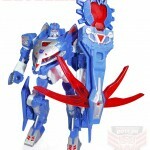 To view the new BOTCON images click the Title Bar.